Falcom's re-imagining of Ys III for the PC and PSP. 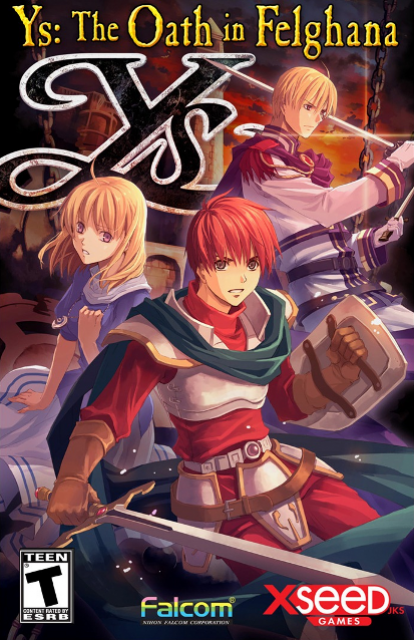 The Oath in Felghana is a remake of Ys III and uses the engine developed for Ys VI: The Ark of Napishtim. The game was originally released for the PC in 2005 and was later ported to the PSP in 2010. Both versions were published in the United States by XSEED. The PSP version was released first on November 2, 2010 and the PC version was later released on Steam on March 19, 2011. The Steam release supported Steam achievements, Steam Cloud, high resolution graphics, full widescreen, and gamepads. Both of XSEED's releases of Oath in Felghana use a modified version of Deuce's unofficial fan translation that was used in NightWolve's English patch for the PC version. When Adol and Dogi make an unannounced visit to Dogi's hometown of Felghana, it was noticeable that things have changed while Dogi was away on his adventures. Many monsters roam the land and there is also an unsettling rumor of a long-dormant volcano suddenly becoming active again and the King of the land has become more evil with each passing day. The king has even forbid anyone from mining precious ores known as raval, a staple of the economy. As Adol and Dogi begin their search for all the problems Felghana has been facing, they find clues that leads them more towards the dark truths that are somehow linked to each other. The closer they get the higher the stakes that not only includes Felghana but even the whole world. The Oath in Felghana story takes place chronologically right after Ys IV but before Ys V.
Adol Christin: Adol Christin is a skilled swordsman who saved Ancient Ys and proved himself as an adventurer after saving the land of Celceta. After saving the land of Celceta, Adol set sail towards Felghana with his best friend Dogi. Dogi: Adol Christin's best friend, fellow adventurer and former thief. Right after the events of Celceta, Adol and Dogi heads to Felghana which is the homeland of Dogi's. Elena Stoddart: Elena is one of Dogi's childhood friends and the sister of Chester Stoddart. She is a polite young girl who lives in the town of Redmont. Everyone sees her as a cheerful girl but ever since her brother Chester disappeared six months ago she has worried non-stop and even left town by herself to look for him. Chester Stoddart: Chester is one of Dogi's childhood friends and the brother of Elena Stoddart. Chester is the main antagonist of the game and serves under King McGuire as a royal knight.